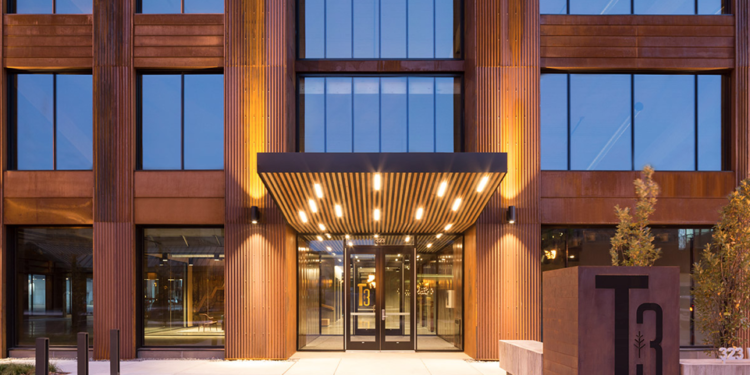 In 2016 Hines completed its prototype T3 project, a 221,000-square-foot, seven story mass timber office building in downtown Minneapolis (Photo courtesy of Hines). Following the announcement last week that McCaffery, Hines and Ivanhoé Cambridge purchased a 1.1-acre land parcel at 3500 Blake Street in Denver’s RiNo, the partnership has unveiled their plans for development. The parcel will be developed into a six-story, 250,000-square-foot T3 (Timber, Transit and Technology) office building that according to Hines, will be one of the most environmentally friendly and sustainable developments in Denver. The Partnership will work with Pickard Chilton Architects, the team behind notable office projects including Denver’s 1144 Fifteenth Street; 609 Main at Texas in Houston; and Chicago’s River Point. The building will feature a refined industrial, heavy-timber-structured design, a relatively new phenomenon in the Denver market that is sure to change the city’s landscape as it increases in popularity. According to Michael Hensley, project manager with Pickard Chilton, Timber is a more sustainable material to use than traditional concrete or steel, “The timber works as a sequester to carbon — concrete and steel tend to produce a lot of carbon environmentally speaking and so you are actually benefiting the environment by going with the mass timber construction,” he said. The building will be designed around the idea of collaboration and work/life balance. Amenities will include common social areas; large, private tenant terraces; a modern fitness facility and bike room; 20,000 square feet of retail space and convenient access to the commuter rail system—including DIA and Denver’s Union Station Transit Hub. “As one of the most original office properties in the Denver Market, the project is being designed to accommodate the needs of firms who seek creative class workers. These workers are opting to work in an environment which offers proximity to living, dining, entertainment and recreation options, as well as providing easy access to transit,” said McCaffery Senior Managing Director Glen Sibley. RiNo is Denver’s creative hub, home to artisans, painters, photographers, designers, filmmakers, architects, and “tech” firms. To pay homage to the city’s vibrant and rapidly evolving art district, Markese says the building will incorporate art both externally and likely internally as well. “In our view that’s a big part of designing within that community. As the design evolves, we are looking for ways to create opportunities for art to be part of the exterior of the building and it’s our hope that we can also explore the possibility for art within the interior of the building as well,” said Markese. 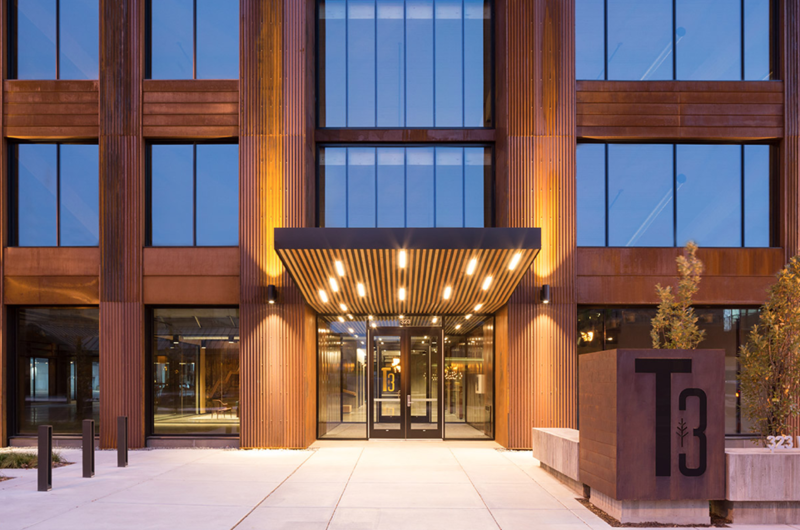 In 2016, Hines completed its prototype T3 project in Minneapolis, an innovative 221,000-square-foot, seven story mass timber office building in downtown Minneapolis. The building was awarded a Wood Design & Building Magazine’s Special Achievement Award as well as the 2017 Azure Magazine Environmental Leadership Award. According to Markese, T3 Denver will likely have some structural similarities but every site is different and this building will be purposely designed to respond to the site in RiNo. Hines currently has two other T3 developments underway in Atlanta and Chicago and announcements are forthcoming for other markets. “We are proud to partner with Hines and McCaffery on this truly innovative project for Denver’s creative and tech business community. T3 will offer a unique, modern and sustainable building solution and work environment to potential tenants and their employees, while enhancing the urban user experience in the neighborhood,” said Arthur Lloyd, chief development officer, Office, North America and vice chairman at Ivanhoé Cambridge. Renderings were not available at the time of publication.